I love the smell of PCBs in the morning. 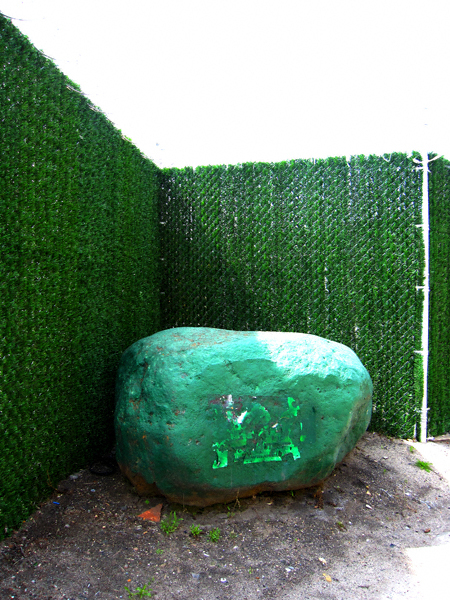 I’m not going to argue with you, but could you tell me why this rock is painted green? 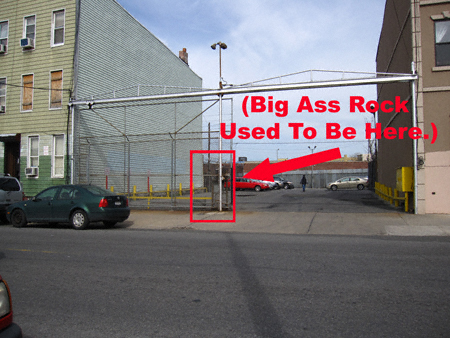 “That rock belongs to the Department of Sanitation” he said “and they do not want anyone taking photographs of their facility”. 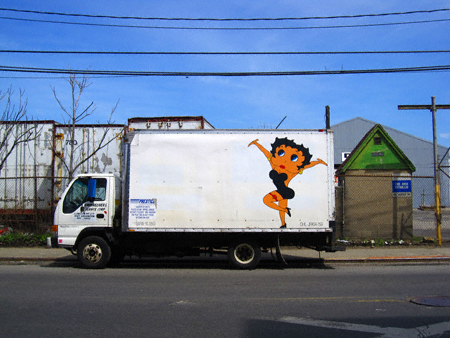 …I’ve found Betty Boop on more things than you can possibly imagine. 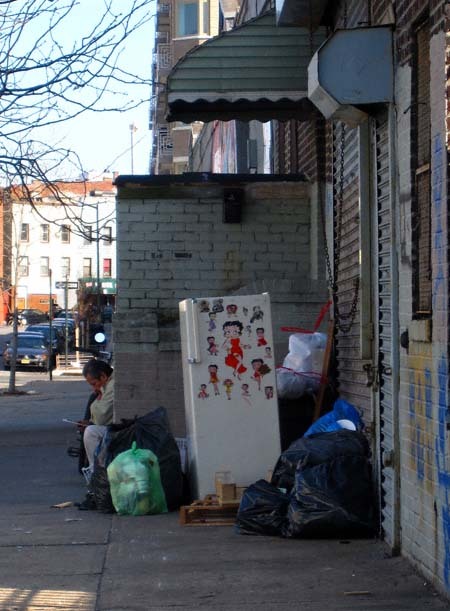 Just a couple weeks ago a found a refrigerator covered in Betty Boop stickers. I took a photograph of that too. 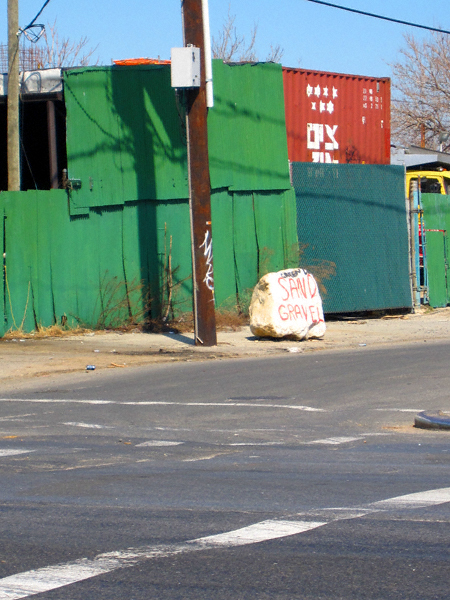 As for that rock, well, I suppose it makes sense that the Department of Sanitation would paint it green. As you said, it is their rock and they can do with it whatever they wish. There are a lot of big rocks in this area. Many of them are painted and I have taken photographs of a number of them. There’s one at the intersection George Street and Evergreen Avenue someone has clad in plaid. There’s also a rather nice boulder at the corner of Vandervoort Avenue and Division Place. It advertises sand and gravel for sale. A pretty witty selling tool if you ask me. 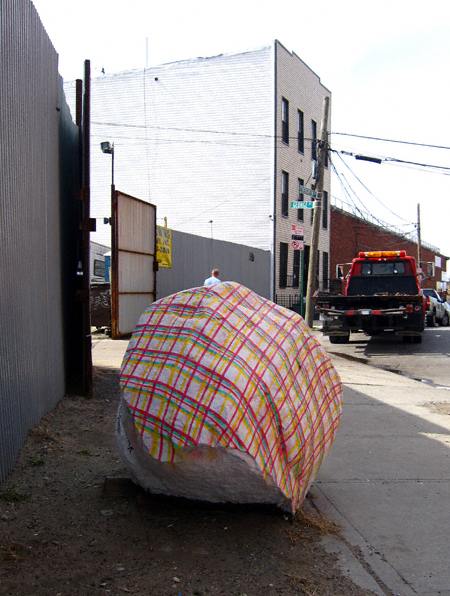 Then of course there’s the rock at Morgan Avenue and Rock Street. That one has since been removed. Why I don’t know. Some people thought it was ugly but I rather liked it. And then you have Arbitration Rock. Haven’t seen that one yet but I plan to! It was at this point my new friend smiled. I suspect his years of experience informed him that a daft 30-something broad clad in pink pants, pink shoes, pink shirt, pink jacket and pink hair held at bay with an aqua blue bandanna (I lost my pink one a month ago) babbling about North Brooklyn’s boulders did not constitute a security breach. At least not one worth contacting the authorities about. 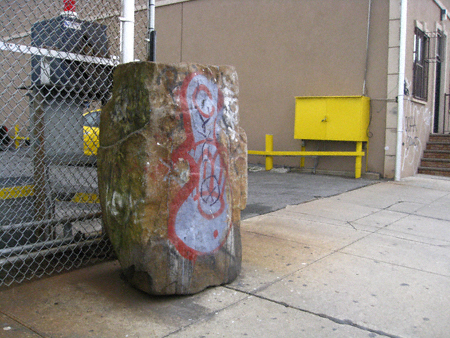 Long story made short he relented and let me take a photograph of the Department of Sanitation’s rock. Whoever you are security dude I will be eternally grateful to your generosity for allowing me to add this big boy to my collection. Thanks!